South Africa is the sixth country in the world (after USA, Australia, Brazil, and Canada) to form a local IAIA affiliate. South Africans attending the annual congress of IAIA in Washington DC in August 1992 formed a steering committee to launch the IAIAsa later that year, which was also the year of the original Rio Summit. The IAIA affiliate was formally recognised by the parent body at its mid-year meeting in Mexico in February 1993. The primary objective of IAIAsa is to create a “home” for those people who wish to exchange information on, or learn more about, impact assessment. South Africa has received international acclaim for its Integrated Environmental Management procedure and for the high quality Environmental Impact Assessments undertaken in this country. The IAIA South African affiliate (or IAIAsa) functions as a voluntary organisation representing the interests of environmental practitioners and allied professions. We have approximately 1000 members in South Africa and neighbouring SADC countries, organised around nine regional branches (Gauteng, Limpopo, North-West, Free Sate, KwaZulu-Natal, Western Cape & Eastern Cape, Mpumalanga & SADC-branch). One of the highlights on our calender is the annual IAIAsa National Conference, at which up to 35% of our members get together every year. 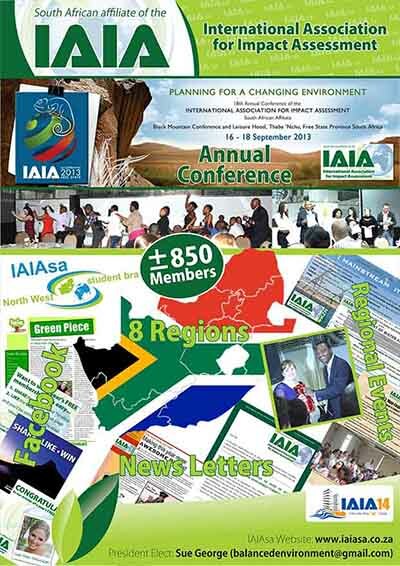 The 2013 Conference was held from 23 – 25 September in 2013 at the Black Mountain Resort near Thaba N’chu, Free State. The 2014 Conference was held at Gallagher Estate, Gauteng from 27 -29 August 2014. In 2015 the Conference will be in held in the coastal province of KZN. Watch the Annual Conference tab for details. If you would like to learn more about the IAIAsa Code of Ethics and constitution, or if you would like to find out about the IAIAsa National Executive Committee and regional branches, you can navigate to any of the main menu options above.